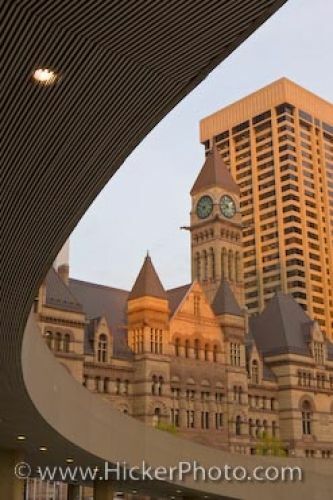 As the sun sets in downtown Toronto, a view of the Old City Hall building is seen from an architectural curve of the New City Hall. The Old City Hall building shows its classic architectural style. The clock tower of Old City Hall stands tall among the buildings. A tall modern building stands in the background of Old City Hall. Old City Hall building seen from outside the New City Hall in the Nathan Phillips Square at sunset in downtown Toronto, Ontario, Canada.